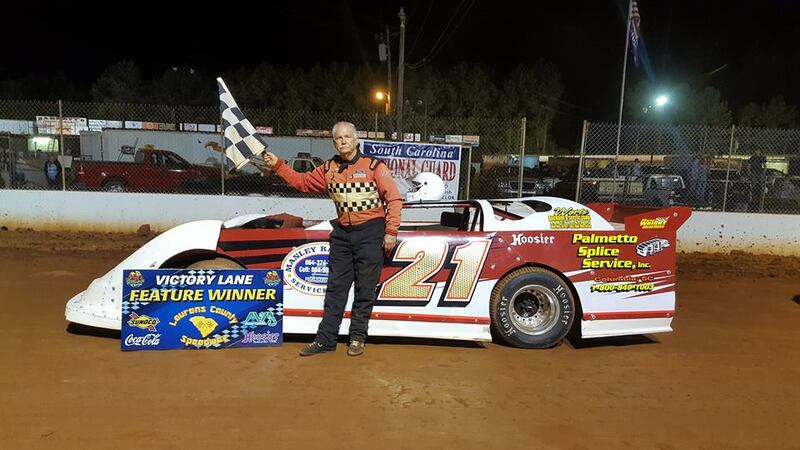 Veteran Laurens County Speedway racer Frank Coates found his way back into Victory Lane Saturday night in the main event of the Limited Division. Coates held off a late charge from Michael Smith, who had won the season’s first two races, to win the main event. Following second-place Smith was Brad Rachels, who was third, Chris Lyons in fourth and Billy Rushton in fifth. For much of the race the battle was between Coates and Rushton, who had started in third but moved up to second on the opening lap by getting past Rachels. Coates stayed on the outside line through the turns for the duration of the race, while Rushton continually looked to the inside. As the laps went on Rushton progressively got closer to Coates, especially coming out of Turn 2, eventually getting side-by-side with Coates for a time. But each time Rushton appeared ready to make a final push to take the lead, Coates punched the gas and opened just enough separation to maintain his lead. Rushton had to check up with five laps to go, giving Coates a slightly bigger lead, but Rushton rebounded and closed the gap as quickly as it appeared. Coates, fighting with all his might, still managed to maintain his lead until he got a fortuitous break with Rushton spun out with two laps to go to end his night. That brought up Smith, who had qualified to start on the inside of Row 3, up to second place and gave him a shot at making a pass, but his challenge never got as close as Rushton’s did. That allowed Coates to hold on over the green-white-checkered finish and give him the victory. SECA 604 Crate: Ray Storay won his second main event of the season by taking the checkered flag. He topped Terry Bullard, who finished in second, and third-place finisher Goose Calvert. Storay qualified in first with a time of 15.641 seconds to edge out Bullard for the top spot, and on the start Storay jumped out to the lead. He quickly built a healthy lead as Bullard and Calvert started to battle each other for second place. Despite opening up a slightly healthy lead for second late in the race, Bullard had to hold on late with Calvert closing the gap, but Calvert slid going through the first two turns with two laps to go to give Bullard just enough separation to grab a secure hold of second. All the while, however, Storay was never challenged. He was well ahead of the rest of the field and not impacted by any lap traffic, allowing him a clean run that proved to be enough to get to the top spot. FWD: First he won, then he didn’t, then he did. It was an up-and-down night for J.J. Williams in the Front-Wheel Drive main event after he won over Mason Mack, who finished second – and third-place finisher Bobby Anthony – a decision that wasn’t finalized until very early Sunday. After qualifying first overall, Williams started on the pole for a main event that took four tries to finally get through the opening lap without a hitch. Once it started single-file the field got through cleanly, and Williams held onto the advantage. Mack stayed in second place and Anthony held third after the first six laps of the main event, and the drivers held firm in their spots until the checkered flag flew. That’s when things appeared to change. Mack protested Williams for his car, and in the initial ruling officials determined Williams’ car failed inspection. Mack appeared set to take first as a result, but after further consultation it was ruled Williams’ car had failed under what had been the 2016 rules, not this year’s new rules. When the new rules were applied, it turned out Williams had passed, reverting the results of the main event to their original order. Monster Minis: Rod Tucker went from fourth overall after his heat to first at the end of the main event, giving him his first victory of the season at LCS. Travis Sharpe was second and Phillip Wilson was third. Sharpe and Wilson qualified to start on the front row, but Wilson started further back in the field instead. 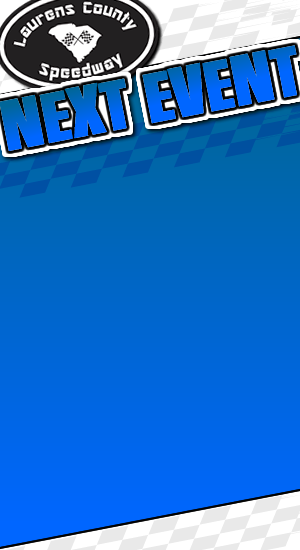 His move proved effective when he got back to fourth on the first lap, and persistence paid off when he eventually got to third with two laps left. Sharpe fell off the early lead, with Tucker moving up into the top spot, but Sharpe held firm in second place as the top two drivers were well ahead of the field. Tucker, once he got to the lead, never felt a serious challenge and won comfortably. 602 Crate: Mart Patterson was back in Victory Lane after missing out on the race last week, denying second-place finisher Chris Patterson his second straight victory. Lucas Motte was third, finishing behind both Pattersons. Both Pattersons started at the front of the field following the heat race, and both stayed in their spots as the race began. 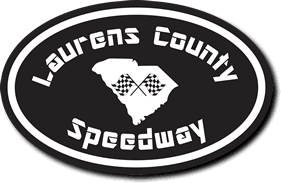 Justin Wrenn, who started the main event third, ran into trouble on the fourth lap as he brought out a caution flag, and was not able to get back into the mix for the victory for the remainder of the 12-lap race. Once the race resumed the top three held firmly onto their positions, with Mart Patterson denying Chris Patterson the chance to make a late-race pass. Thunder Bombers: Bobby Tucker won the main event, with Dylan Chappell second and Troy Bagwell third. After the first attempt at starting the main was wiped out, which moved the entire front row of Chappell and Casey Lawson to the back, Tucker got a jump on Shane Roberts and managed to move in front of the field. The field remained unchanged until the next-to-last lap when the caution came out as Roberts was hit and spun. The caution came out after the leaders took the white flag, meaning the race would finish under the yellow flag, but Tucker had just enough to deny Chappell at the finish.